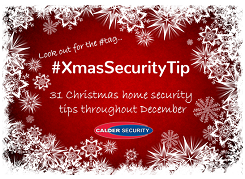 Christmas is the time for giving but for burglars it is peak time for taking. As we all fill our homes up with presents for family and friends, burglars are rubbing their hands with glee over the haul they could yield from every house they target. Add to this the fact that darkness offers cover from around 4pm plus we’re all so preoccupied with Christmas preparations that security is not always the first thing on our minds and you create the perfect wish list for any would-be intruder. Because we know that you’re busy and you don’t have time to read through long articles about home security we have prepared a little nugget of security advice for every day in December. These are Christmas-specific tips that are simple to follow and will really help you get through the holidays without incident. We’ll be sharing these tips on our Twitter and Facebook feeds every day. We’ll also be posting them here on the website. We suggest that you just take 2 minutes each day to read them as it could give you information that will make all the difference to your home security.